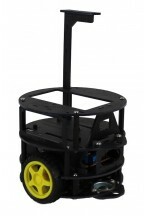 The Compact Rover is one of our introductory robots to the new line of educational robotic rover kits. This kit comes unassembled. The purpose of this robot kit is to teach the student about microcontroller programming, reading a schematic, interfacing the parts of the kit, completing tasks. The primary lessons of this kit are: Random Dance: Programmable speed and direction. This kit is driven by two wheels and a skid. Scribble: Uses a servo to engage a pen. The pen will mark the robot's route on paper or po.. The Droid Rover is one of our introductory robots to the new line of educational robotic rover kits. This kit comes unassembled. The purpose of this robot kit is to teach the student about microcontroller programming, reading a schematic, interfacing the parts of the kit, completing tasks. The primary lessons of this kit are: LCD Display: Interacts between the controller to a user by LCD display. This robot kit can operate automatically by loading the controller with the appropriate code. The LCD allows us to quickly show infor.. 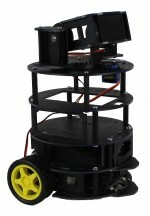 The Half Droid is one of our introductory robots to the new line of educational robotic rover kits. This kit comes unassembled. The purpose of this robot kit is to teach the student about microcontroller programming, reading a schematic, interfacing the parts of the kit, completing tasks. The primary lessons of this kit are: LCD Display: Interacts between the controller to a user by LCD display. This robot kit can operate automatically by loading the controller with the appropriate code. The LCD allows us to quickly show information w.. 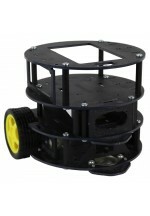 The Round Rover is one of our introductory robots to the new line of educational robotic rover kits. This rover is 6 inches round. This kit comes unassembled. 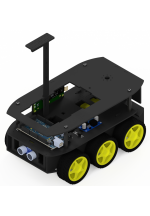 The purpose of this robot kit is to teach the student about microcontroller programming, reading a schematic, interfacing the parts of the kit, completing tasks. The primary lessons of this kit are: LCD Display: Interacts between the controller to a user by LCD display. This robot kit can operate automatically by loading the controller with the appropriate c.. The 6 Wheeled Weeble ATV is one of our introductory robots to the new line of educational robotic rover kits. This kit comes unassembled. The purpose of this robot kit is to teach the student about microcontroller programming, reading a schematic, interfacing the parts of the kit, completing tasks. The primary lessons of this kit are: LCD Display: Interactions between the controller to a user by LCD display. This robot kit can operate automatically by loading the controller with the appropriate code. The LCD allows us to quickly show informat.. 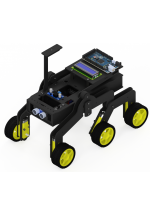 The Bitty Rover is one of our introductory robots to the new line of educational robotic rover kits. This kit comes unassembled. The purpose of this robot kit is to teach the student about microcontroller programming, reading a schematic, interfacing the parts of the kit, completing tasks. The primary lessons of this kit are: LCD Display: Interacts between the controller to a user by LCD display. This robot kit can operate automatically by loading the controller with the appropriate code. The LCD allows us to quickly show information whil.. The Hex Walker is one of our introductory robots to the new line of educational robotic kits. This kit comes unassembled. The purpose of this robot kit is to teach the student about microcontroller programming, reading a schematic, interfacing the parts of the kit, completing tasks. The primary lessons of this kit are: Random Dance: Programmable speed and direction. This kit walks on two sets of three legs; each set of legs is driven by one motor resulting in insect like movement. Ultrasonic and Touch Obstacle Avoidance.. The Inverted Pendulum Balance Bot is one of our introductory robots to the new line of educational robotic rover kits. This kit comes unassembled. The purpose of this robot kit is to teach the student about microcontroller programming, reading a schematic, interfacing the parts of the kit, completing tasks. The primary lessons of this kit are: LCD Display: Interacts between the controller to a user by LCD display. 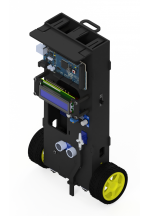 This robot kit can operate automatically by loading the controller with the appropriate code. The LCD allows us to quickly show in.. Program for using the I2C LCD panel included with our robot kits. Messages can be sent from the computer via serial communations to the controller using either the Arduino IDE or PuTTY to be displayed on the LCD panel. 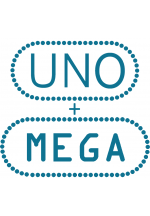 Since the program uses I2C communication to connect to the LCD panel, it is both UNO and MEGA compatable. Note: This program needs extra libraries installed into the Arduino IDE in order for it to work. A full list can be found in the header of the program. .. Example program to use on MEGA based robots. Makes the robot follow a black line drawn on the ground, and corrects course when nescessary. Compatable with any MEGA based robots with IR Line Followers .. 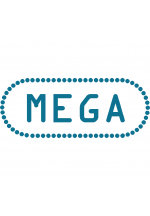 Example program to use on MEGA based robots. 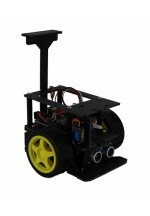 Moves the robot around randomly, alternating from driving straight, spinning, and turning. Speed can be adjusted in-program. .. 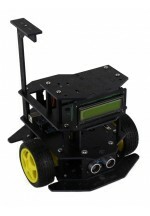 The Rockin Rover is one of our advanced robots to the new line of educational robotic rover kits. This kit comes unassembled. The purpose of this robot kit is to teach the student about microcontroller programming, reading a schematic, interfacing the parts of the kit, completing tasks. The primary lessons of this kit are: LCD Display: Interacts between the controller to a user by LCD display. This robot kit can operate automatically by loading the controller with the appropriate code. The LCD allows us to quickly show information whi..